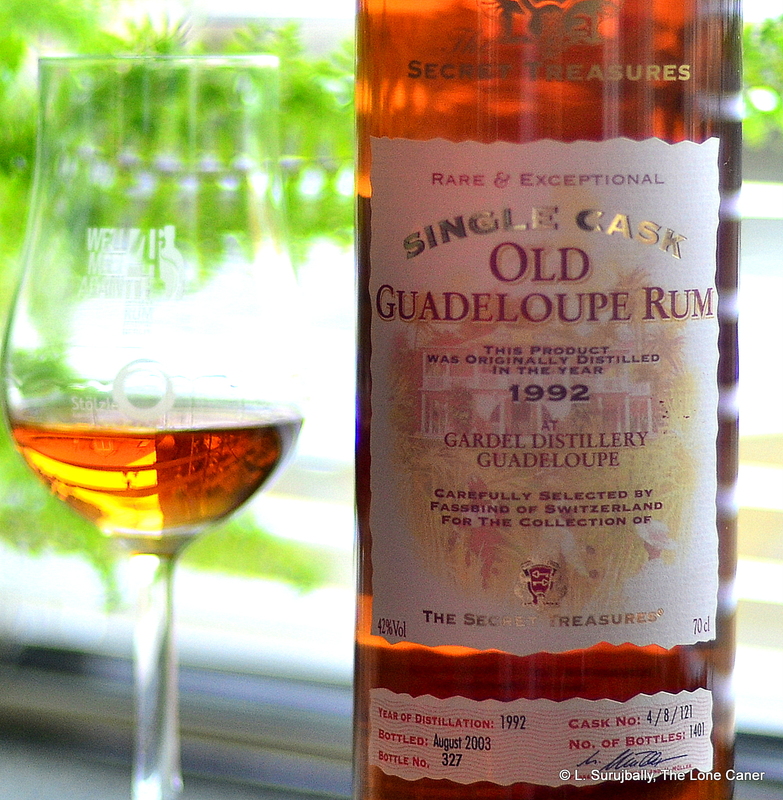 The independent bottler Secret Treasures is no longer the same company it started out as, and this particular and delectable Guadeloupe rum was selected by the Swiss concern Fassbind before they sold off the brand to Haromex in 2005. 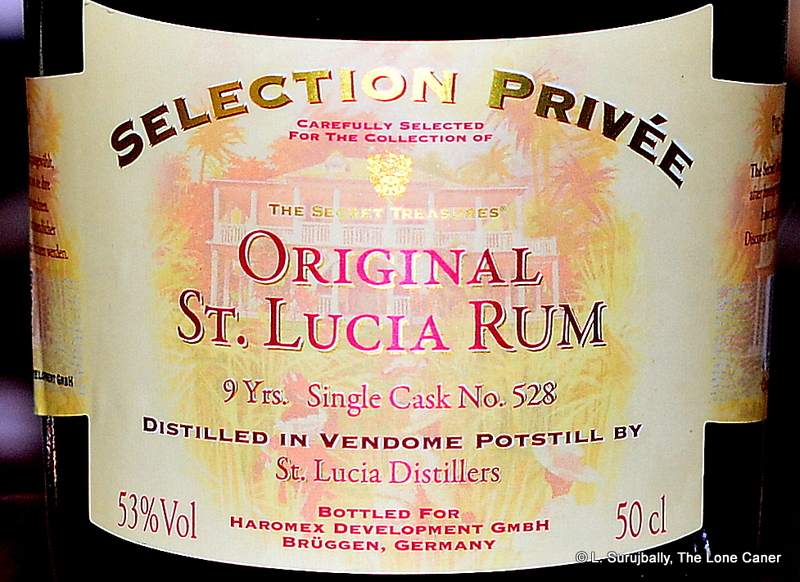 So although Haromex is now making a new line of rums under the ST label (like the St Lucia Vendome and John Dore still rums I’ve looked at before), this rhum predates them and is part of the original line up. Guadeloupe is, of course, somewhat general a term so let me expand on that by saying the rhum originates from the Gardel Distillerie located in the north-east of Grand Terre in the commune of Le Moule. Gardel, owned by Générale Sucrière, a major player in the global sugar refining industry, is one of two distilleries in Le Moule (the other is Damoiseau) and earns some of its distinction by being the sole refinery on the main island. I don’t think Gardel makes any rhums of its own but sell rum stock to brokers and others – however, there is maddeningly little information available and I’ve got some queries out there which may make me amend this portion of the post in future. Some basic facts on the rhum then, just to set the scene: it was from the Gardel distillery, distilled 1992 and bottled August 2003 from three casks which provided 1,401 bottles (this was #327). It was issued at a relatively unadventurous 42% which would have been fairly standard at that time, and one can only wonder what it has been doing for the last fourteen years and why nobody ever bought the thing. Since I had and retain a sneaking appreciation for Secret Treasures ever since I had their excellent Enmore 1989, there were no battles with my conscience to buy a few more from their range. 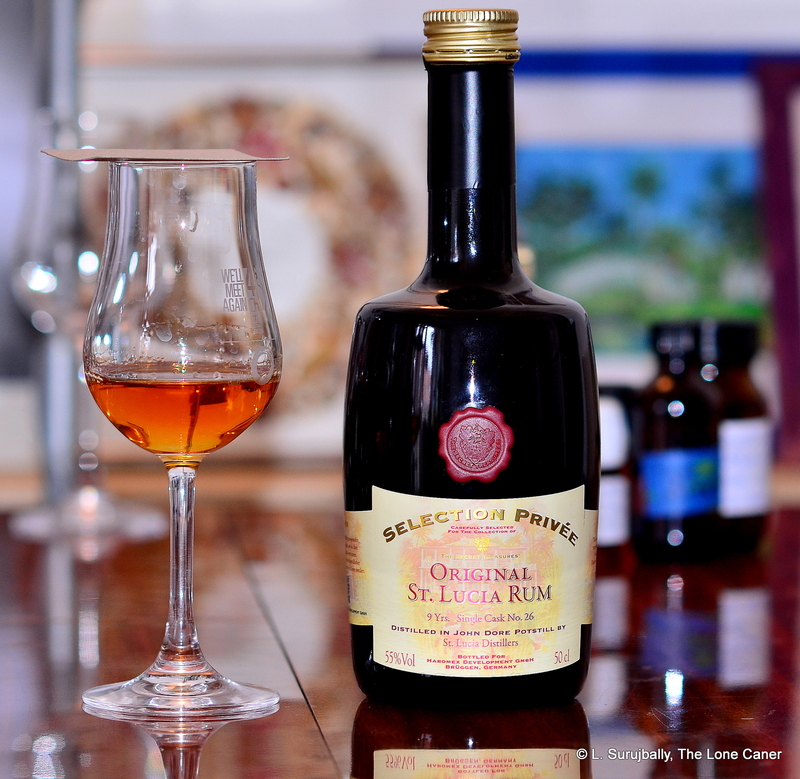 Note that it is labelled as a “rum” (not rhum) and I have no absolute confirmation whether it was truly cane-juice derived, or where exactly it was aged (even Reference-rhum, that online French-language encyclopedia of rum brands, says “molasses” with a question mark under its entry). 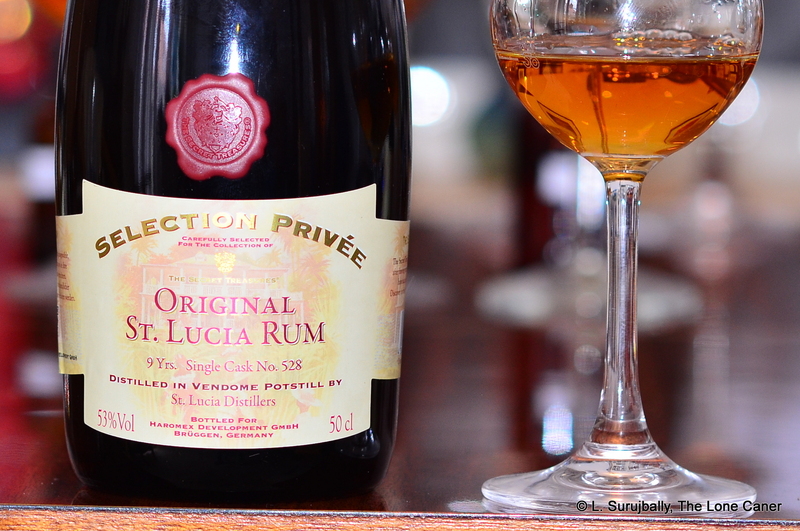 In any event, whatever its ultimate source or point of ageing, I thought it was a zippy and sprightly rhum of initially crisp clarity and cleanliness. Coloured orange-amber, it nosed in surprisingly bright and clear fashion, immediately giving up aromas of honey, flowers and 7-Up (seriously! ); over a period of minutes a more solid briny background emerged, accompanied by perfectly ripe fleshy fruits – peaches, apricots, sultanas and raspberries. Not particularly fierce or savage – it was too laid back and standard strength for that – but a very enjoyable nosing experience, the sort of easy going yet sufficiently assertive profile to have one curiously going deeper into it just to see where the rabbit hole led. Aside from a certain lightness to the profile, the palate provided a soft series of tastes, which were fruity, floral, musky and delicate all at the same time. It was hard to know what to make of it – initially there were flowers, fudge, salty caramel, coconut, and vanilla, counterpointed with lemon zest, green apples, grapes and peaches. After a while additional flavours evolved: maple syrup, aromatic tobacco and vague coffee. Some of the crispness of the nose faded into the background here, and overall it did not present the sort of complexity that would advance it to the top shelf, but it was distinct enough to grab the attention, and at the very least it was intriguing, and for sure quite pleasant to drink. Perhaps the finish was the weakest part, being short and easy and light, mostly reminding one of caramel, light fruits, and raisins, which goes some way to making me wondering whether it was a true cane juice distillate (it lacked the distinctive herbal grassiness of such a product), or from molasses. 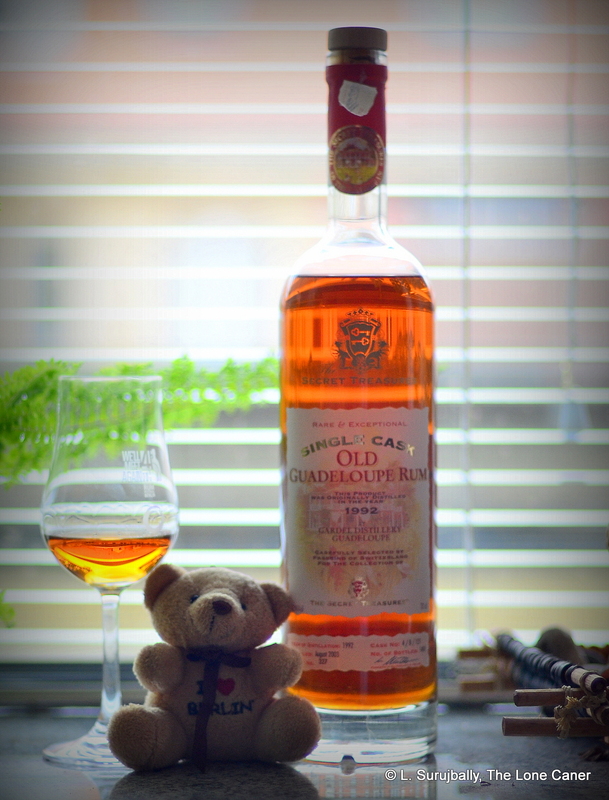 One thing was clear though – it was nicely made, and wore its middle age well, without any kind of raw edge or jagged sharpness that distinguishes extremely young bottom-tier rums. So: trying this clean and playful Guadeloupe rhum in tandem with the L’Esprit Bellevue 58% 8-year-old and the Longueteau 6-year-old VSOP, I felt the last two rhums were remarkably similar, though I liked the soft honey and maple-syrup notes of the Secret Treasures just a little more, and the L’Esprit better than both, which just goes to show that ageing isn’t everything, especially in the world of agricoles (remember the spectacular Chantal Comte 1980?). 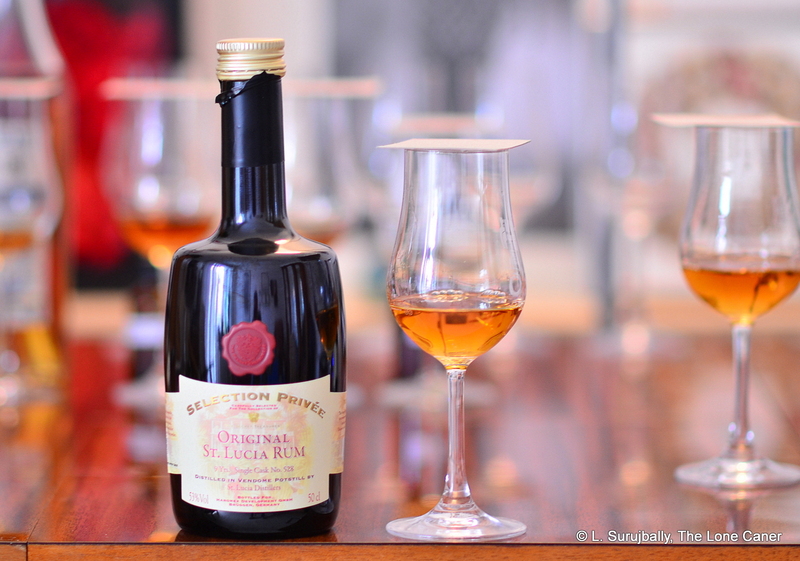 Be that as it may, there’s nothing at all bad about the ST Gardel 1992 rhum, and in fact it makes me really interested to try the 1989 variation, just to see how it stacks up. These days Fassbind is long gone from the scene and Haromex is making changes to the labels and the line up – but for those of you who come across some of the original bottler’s expressions dating back from the eighties and nineties, you could do a lot worse than pick one of them up, if for no reason than the pure and simple enjoyment of a well-aged rhum, well made, almost forgotten, and tasting just fine. The Gardel plant, also known as Sainte-Marie, is the only sugar plant which still operating in Guadeloupe. It was founded in 1870 and its first owner was Benjamin François Benony Saint-Alarey, who chose to pay homage to his paternal grandmother in his naming of the factory. In 1994, the sugar sector in Guadeloupe underwent major restructuring, leading to the closure of all sugar factories on the island except Gardel which is currently composed of an agricultural part with a 1000 hectares and an industrial area. It produces nearly 100,000 tons of sugar per year. Information about the distillery is much more scant, unfortunately, though there’s a curious note by Ed Hamilton on the original Ministry of Rum forum, that it was closed by 1994…and the label for Renegade Guadeloupe 1998 mentions both a column still, and 1992 as the last date of any distillation. Phenomenal single cask expression of an older Guyanese rum. Dark, fruity and excellent – cheap, too, so if it can be found, it’s worth a buy. I had to go to Germany to pick up this rum, and the greatest surprise for me was the fact that it’s a Swiss concern that makes it. Swiss? I can hear you say…what the hell are the cantons doing making what is culturally seen as a tropical (Caribbean, let’s be honest) tipple? Fassbind AG is taking a leaf out of the book of those dour Scots of Cadenhead and Bruichladdich et al, and have taken rum deriving from the Enmore distillery in Guyana, and bottled it after slumbering for fourteen years down there in Mudland. This rum reinforces my belief that my personal tastes run primarily to Guyanese rums (with perhaps Panamanians running a close second). 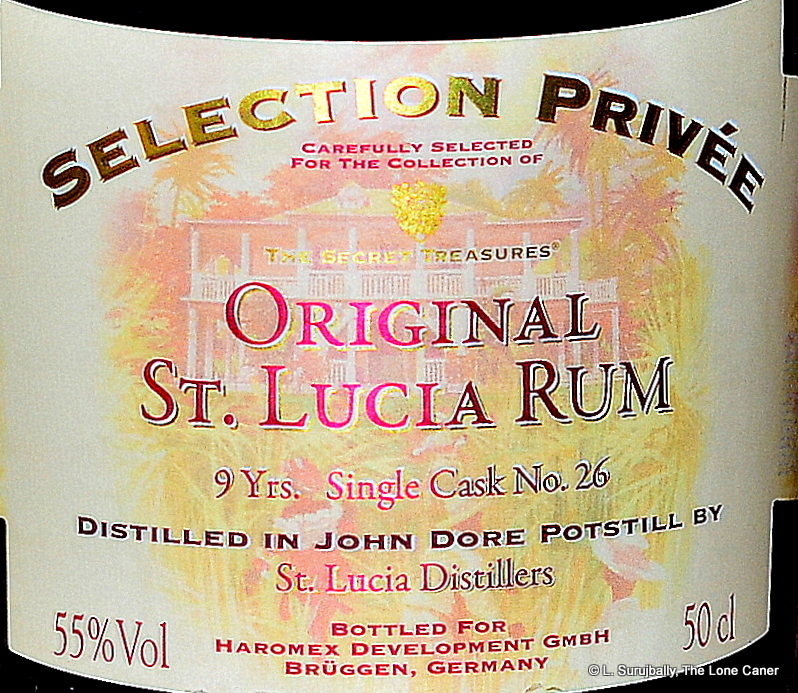 I honestly believe that this is one of the best rums of its price to be found (I paid under €40 for it at the awesome shop Rum Depot in Berlin, where some five hundred rums – the joint sells nothing else – cried out for my attention). It is, in my estimation, just short of exceptional. Ensconced in a tall, cork-tipped, neatly etched, fascinatingly labelled bottle that may actually be originally meant for wine, this 42% single cask offering of dark brown hue made an uanpologetic grab for command of my senses immediately upon opening. To my surprise, I noted the same feinty, deep winey and red-grape notes that so characterized the Rum Nation Demerara 23 and Jamaica 25 rums (and which so, to my mind, ruin the Legendario by being too excessive): but as with those, I must mention how this scent should not dissuade you from forging ahead. Once the rum settled down, it developed into a rich melange of liquorice, rock candy and cinnamon, and was soft and deep and sweet to the nose, with no sting or nastiness that I could discern. And if it was lovely on the nose, the arrival delivered: it had an oily full-bodied palate, presenting the thick strong legs of a Guyanese bushman used to drugging two quake o’ hassar out of the backdam every morning. 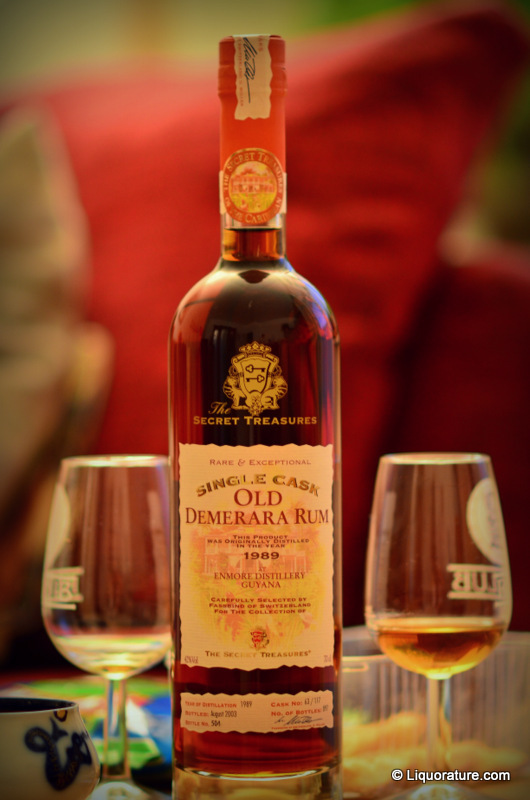 Heated — yet not over-sharp — the first tastes were of honey and red grapes, peaches and fleshy fruits, which then billowed out into a well rounded profile that further developed into an excellent sipping rum, strong, deep and delicious. Even at the tail end, the finish didn’t falter: like Usain Bolt relaxedly cruising past the finish line on a good day, the rum exited with a long-lasting, heated and dusty-dry leatheriness redolent of old and well-loved family libraries. Good rum, this. I had four glasses one after the other, gave some to my nominally teetotaller mother to try, and she was so enraptured with it that I had to physically wrest the thing away after her fifth shot. The Enmore sourced rum was distilled (by DDL) in their famous wooden Coffey still in 1989, and bottled in 2003 – subsequently, I believe all the wooden stills were moved to Diamond estate. 117 casks came out of the run, the 63rd of which delivered 897 bottles…this is the 504th. From what little research I have been able to do, it is clear that all ageing took place in Guyana, after which the bottles were shipped to Switzerland for labelling and further distribution to the shop that is probably not near you. I suspect from the richness of the rum and its dynamism on the palate, that this is not chill filtered, nor does it have any inclusions to alter the makeup. Fassbind SA (SA stands for Société Anonyme, the equivalent to PLC – the wesbite is at www.Fassbind.ch) has been in the spirits business since 1846 when when Gottfried I. Fassbind founded the “Alte Urschwyzer”distillery in Oberarth to make eau de vie (a schnapps). He was a descendant of Dutch coopers who had emigrated to Switzerland in the 13th century and thus laid the foundation for what is now Switzerland’s oldest distillery. They make grappa, schnapps and other spirits and from what I gather, they branched out into rums in the early 2000s. Rums are carefully sourced, aged at the origin distillery, and then shipped to Switzerland for dilution with Swiss spring water to drinking strength (no other inclusions). In that way they conform to the principles of limited edition rums of other bottlers like Berry & Sons and Rudd, Bristol Spirits, Cadenhead, Bruichladdich’s Renegade line, or Cognac Ferrand’s Plantation Rums. I can’t remember who it was that rather snarkily remarked “In a century of war and strife, Italy produced Galileo, Michelangelo, da Vinci and the Sistine Chapel; five hundred years of peace, and the Swiss invented the cuckoo clock.” I sort of take exception to that. I like things that work, that are precisely and exactingly put together, that do what they are built to do with a minimum of friggin’ around. That’s why I own manual, mechanical cameras, and have an equally mechanical Swiss watch (and no, I don’t have a cuckoo clock, you can stop your snickering there in the peanut gallery, fella). Fassbind, very much like other boutique rum makers, have a good handle on how to produce a phenomenally good limited edition rum. With this fascinating study in simplicity and complexity, they’ve delivered a good product at a price anyone can afford and should try at least once…always assuming they can find it.